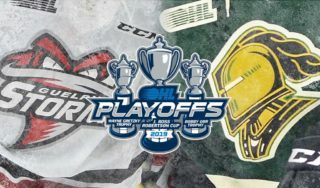 A four-goal explosion and a 42-save performance from Jordan Kooy propelled the London Knights past the Owen Sound Attack 4-1 on Friday night. Normally staying patient is crucial around a different holiday in late December, but as Thanksgiving weekend began, doing that proved fruitful for the Knights as they picked up their third victory of the year, coming back against a strong Owen Sound side. Through two periods, Attack goalie Mack Guzda felt as tough to fool as a bathroom scale after Thanksgiving dinner, but Connor McMichael found a way to put a puck past him early in the third and it broke open a nice set of floodgates for London. Kooy earned his third victory in three starts in the Knight net, kicking out pucks that came at him from all over the ice as Owen Sound topped the 40-shot mark for the third consecutive game. London will now get a weeklong break before their schedule becomes thick like gravy with three games in two-and-a-half days next weekend. The Attack struck first while the Knights were on a power play. Markus Phillips chipped a puck into centre ice sending Maksim Sushko and Aidan Dudas in alone on a two-on-oh breakaway. 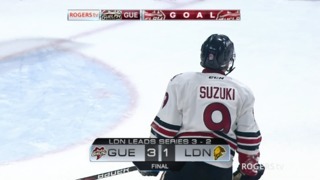 Sushko dished to Dudas and he scored to make it 1-0 Owen Sound. The game stayed that way until the first two minutes of the third period when Connor McMichael carried in across the Owen Sound line, worked his way toward the net and wristed the puck inside the left post for his fifth goal in five games and a 1-1 tie. Adam Boqvist picked up his first point as a Knight. Two fancy plays by Adam Boqvist and Matthew Timms led to the eventual game-winning goal by Nathan Dunkley. Boqvist laid a drop pass right on the blue ice of the blue line and Timms scooped up the puck, spun around a defender and fed Dunkley in the right corner. The Campbellford native drove to the net and crammed the puck past Attack goalie Mack Guzda to put London ahead 2-1. 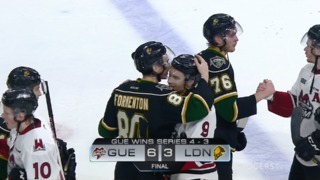 Liam Foudy made it 3-1 on a nice feed from Cole Tymkin out of that same right corner spot and then Foudy won a race to the puck with the Owen Sound net empty and scored his third goal in three games to end things off for London. After back-to-back games, London does not play again until Friday, Oct. 12 when they host the Sarnia Sting for the first time since the pre-season. Sarnia lost quite a few players to graduation, but began this year with a 3-0 record before losing 5-2 to Owen Sound on Oct. 3 in a game that saw the Sting surrender 50 shots on goal. 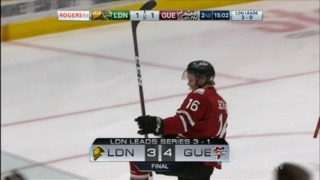 This will be the first of six games between London and Sarnia.